After a busy weekend of Game 1s, with four games on each day, the 2019 NBA playoffs slow down a bit on Monday night. There are just two games on the schedule, one in the Eastern Conference and one in the Western Conference. Starting things out, the Philadelphia 76ers will try to even their series with the Brooklyn Nets after D’Angelo Russell and Co. took a surprising 1-0 lead. The good news for Philly is they’ll have All-Star big man Joel Embiid in the lineup. He was listed as questionable due to a sore knee, but will be available. In the second game of the doubleheader, the Golden State Warriors and Los Angeles Clippers will renew their rivalry. The Warriors pulled away from the Clippers for a fairly comfortable win in Game 1, but there was some drama, with Kevin Durant and Patrick Beverley both ejected. Spencer Dinwiddie and Jarrett Allen combined for an impressive alley-oop toward the end of the first half. The Nets guard tossed it way up to his big man, who threw it down hard. The Nets love launching 3-pointers, and their long-range attack led to a rare sequence in the first quarter where they hit two and-one 3s in a span of 90 seconds. Joel Embiid ended up playing in Game 1 of the Sixers’ first-round series with the Nets, and he’ll be back in the lineup again on Monday night for Game 2. It doesn’t appear that his knee problems have gone away, but at least for now it’s manageable enough for Embiid to still get out there. He finished with 22 points and 15 rebounds in Game 1, but shot just 5-of-15 from the field, including 0-of-5 from 3. 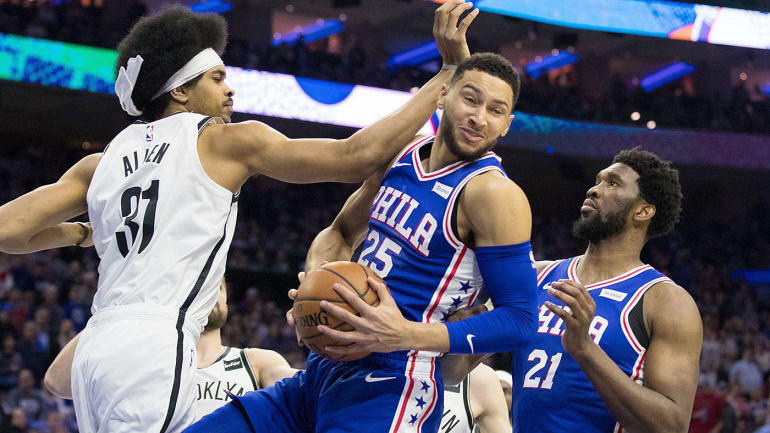 The Sixers will need a more efficient performance from their star if they want to avoid a disastrous start in this series.